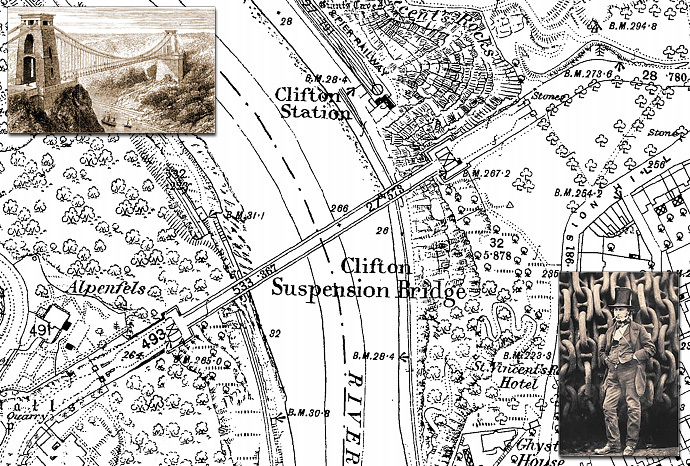 150 years ago today on the 8th December 1864, the Clifton Suspension Bridge had its grand opening. The bridge spans the Avon Gorge and the River Avon, linking Clifton in Bristol to Leigh Woods in North Somerset. The bridge is built to a design by William Henry Barlow and John Hawkshaw, based on an earlier design by Isambard Kingdom Brunel. In 1753 Bristolian merchant William Vick had left a bequest in his will of £1,000 (equivalent to £130,000 in 2014), invested with instructions that when the interest had accumulated to £10,000 (£1,330,000), it should be used for the purpose of building a stone bridge between Clifton Down. By 1829, Vick’s bequest had reached £8,000, but it was estimated that a stone bridge would cost over ten times that. A competion was held to find a design, but all the designs, including a final one by Thomas Telford failed to gain aproval because of either looks or cost. An Act of Parliament was then passed to allow a wrought iron suspension bridge to be built instead of stone, and tolls levied to recoup the cost. In 1831 a second competition was held with new judges. The winner was declared to be a design by Smith and Hawkes of the Eagle Foundry in Birmingham. Brunel then had a personal meeting and persuaded him to change the decision, The committee then declared Brunel the winner and he was awarded a contract as project engineer with his design being finalised by William Henry Barlow and John Hawkshaw . The winning design was for a suspension bridge. Folklore says that a rope was taken across the gorge by kite, or even by bow and arrow! The simple and much more likely event was that common hemp ropes were taken down the side of the gorge, across the river by boat and pulled up the other side. The towers are built principally of local Pennant stone. The chains and suspension rods are made of wrought iron with the chains anchored in tapering tunnels, 25 metres (82 ft) long, on either side of the bridge. After completion of the chains, vertical suspension rods were hung from the links in the chains and large girders hung from these. The girders on either side then support the deck, which is 3 feet higher at the Clifton end than at Leigh Wood. The construction work was completed in 1864 — 111 years after a bridge at the site was first planned.